This Sunday the Hollywood Theatre will screen “The Wake of Vanport,” a new installment in The Skanner Foundation’s series of short documentary films about the city of Vanport, a housing development created for Kaiser shipyard workers at the onset of World War II. The development — which included schools, community centers and day cares — housed the first large influx of African Americans to the Portland area, and was at one time Oregon’s second largest city. While segregated by block — with Black families living on one block and White families living on the next – its public facilities were racially integrated. Most families who lived in Vanport came from heavily segregated Southern communities, and businesses in Portland itself were often segregated. Due to a housing shortage in Portland, many Vanport residents continued to live there after the war ended, though the homes were small and hastily built. Then on Memorial Day – May 30, 1948 – the city, which at its peak had a population of 42,000 people, washed away in a matter of hours. A Columbia River dam burst and all the major structures in Vanport were destroyed. “The Wake of Vanport” series features interviews with surviving Vanport residents, most of whom were children at the time of the flood. The collection of 10 short films that will be screened this weekend is the second collection of shorts in the series, and Sunday’s screening is a reprisal for anyone who may have missed last November’s showing of the new series. Several of the shorts can also be seen at the Hollywood Theatre’s airport microcinema at Portland International Airport, which opened in February. Sunday’s screening begins at 2 p.m. at 4122 NE Sandy Blvd in Portland. The event is free, but space is limited and a reservation is required. For more information, and to reserve a seat, click here. The project’s sponsors include The Oregon Lottery, Hood to Coast, Sweet Jam, Mt. Hood Cable Regulatory Commission, The National Endowment for the Arts. 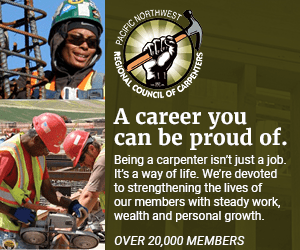 NPMTC Announces Oral History Film Festival Contest, "Life in Vanport"